Ready to amaze the world. What is a woman’s ego? Her character, her allure her ability to fascinate, her vitality and energy, as well as that touch of craziness that makes her unique. Faby’s journey into the universe of women continues with EGO, the 2017/18 autumn/winter collection, in which colour becomes an unstoppable expression of a special and unique woman. 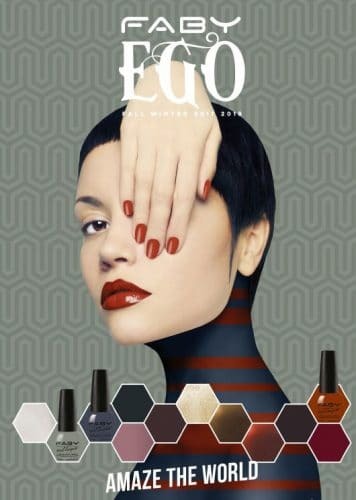 EGO captures the essence of femininity, a colour palette made up of bright and intense shades, in a continuous exchange of contrasts that creates a decidedly sensual mood and makes you stand out. A fascinating collection whose stand-out stars include “UNCONSCIOUS”, a deep burgundy brown that rouses an inner energy, “MY DARKNESS”, a seductive and mysterious midnight blue, “SUPER EGO”, a charming Marsala pink that reveals the many facets of your deepest nature, “IO, IO!” a wicked scarlet red that leaves no room for interpretation, “E-GOLD”, an enchanting ne glittery gold that symbolises the ultimate femininity, and “MIRROR OF MY SOUL”, a satin white with a silky glossiness that simultaneously emanates purity and trickery. and vivid colours and quick drying times. Faby’s products are distributed in the UK by Palms Extra and are sold in the best cosmetics stores and most prestigious beauty stores and beauty salons worldwide.